How do customers of ING Bank spend, save, invest and feel about money? The ING International Survey aims to get a better understanding about how customers and potential customers think about their financial matters. This time the survey was focused on the costs of life events. More than 12,000 respondents from 13 European countries shared their opinion. The result is a realistic look on what people spend on things like a wedding or a house. Check out the outcomes of the survey below. 60% of people in Europe would rather spend their money on a house than their wedding, more couples pay for the big day themselves than have families contribute and 62% of people feel weddings are too expensive for guests. 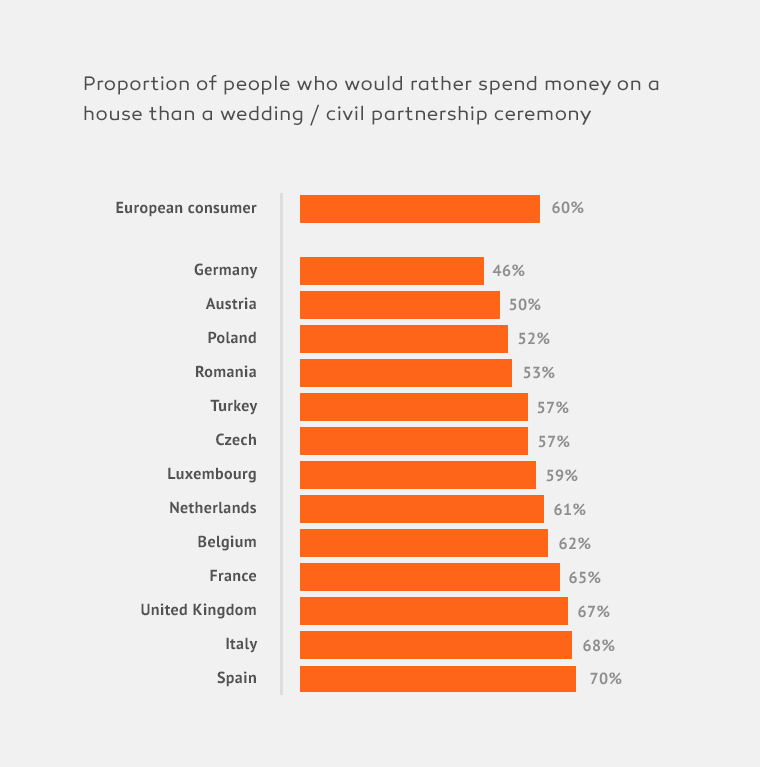 Couples across Europe are choosing love over luxury as they opt for thrifty nuptials, according to our pan-European study of more than 12,000 consumers. 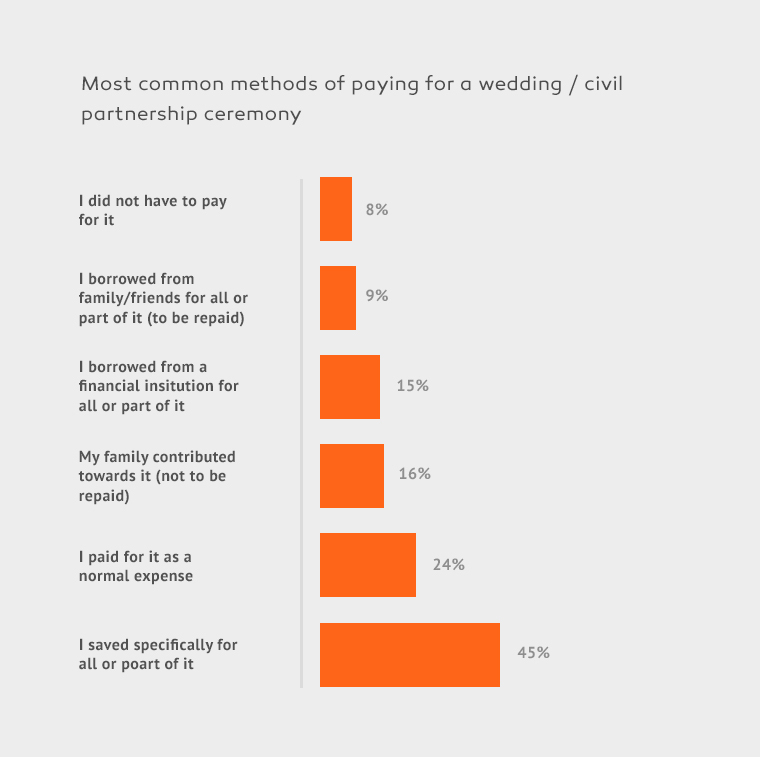 The ING International Survey on Savings reveals the amount brides and grooms are spending on their weddings and civil partnerships may be lower than many people think because of other life costs they have to bear. [text] With property increasingly unaffordable and the cost of living rising, the study found the majority of people across Europe (60%) would in fact rather spend money on a house than their wedding day. The view becomes even stronger in the struggling economies of Spain (70%) and Italy (68%), and the UK (67%) where house prices have been soaring. Furthermore, in a shift from what may have been considered tradition, just 16 per cent of couples receive non-repayable contributions from their families - putting more pressure on the purse-strings as the big day becomes another life cost to budget for. Findings from the survey show couples are shying away from lavish ceremonies with budgets much closer to €5,000 than €50,000. To pay for the happy occasion, almost half of couples (45%) save for it specifically, while 15 per cent borrow from a financial institution and one in 10 (9%) are lent money by their family. As austerity has gripped Europe, brides and grooms have been content with opting for the economical over the extravagant, with only a third (32%) of couples married in the last five years feeling their wedding would have been better with a bigger budget to spend. Of course the cost of a wedding doesn’t just impact the bride and groom, but guests as well. From gifts and travel to outfits, 62% of people across Europe feel that attending marriage ceremonies simply costs too much, suggesting many could be falling out of love with wedding invitations too. The full report International Survey on Weddings and Life Events 2015 is available on Slideshare and can also be downloaded as a pdf. Previous versions of these surveys on financial and economic behavior are freely available at eZonomics. These surveys are conducted by Ipsos.